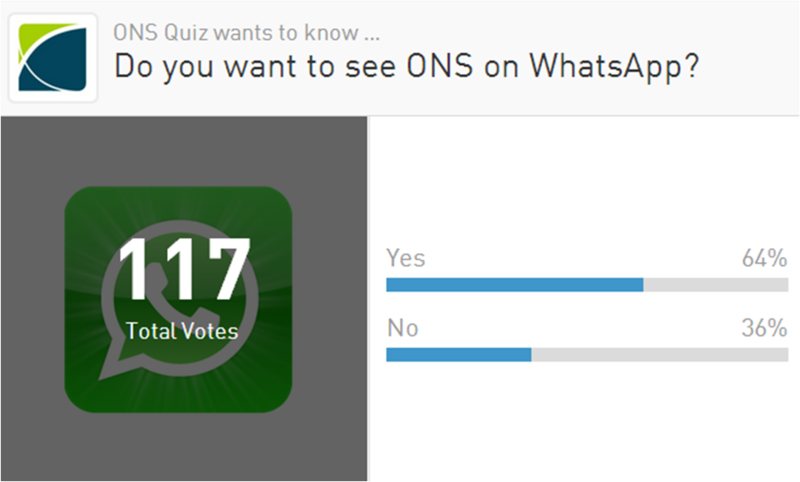 Should ONS be on WhatsApp? Not letting our work in the social media space stand still for too long, we’ve been debating whether ONS should start experimenting with mobile messenger apps. Thinking about WhatsApp in particular, I’d see it adding to our channel mix that day-to-day wouldn’t be too far removed from how we use Twitter. On one hand messenger apps are taking off in a big way as an alternative to (historically) costly text and picture messaging. Blackberry Messenger was among the first which is hailed as a reason why the brand is / was successful with the younger demographic. Facebook Messenger clearly has big weight as does WhatsApp* (which Facebook have bought) and a few others which are either part of a wider social life network proposition or standalone. On the other hand, messenger apps aren’t yet built to fit in with what we do day-to-day here (though we could work it in no problem). More to the point, there aren’t many stellar examples of messenger apps working for users and brands alike. Unless you know of any? We’ve watched BBC and Channel 4 focus on one off subjects (Indian elections and Scottish Independence Referendum respectivily) and Huffington Post make it a daily feature of 1-2 messages. The latter is more akin to our business. That younger demographic point is important. There’s an assumption that only students and youth use messenger apps. The link above suggests that might be right, but how do we know for sure in our case without analytics? It’s the interest in the subjects or propensity to engage with our content that’s important. Setting up WhatsApp and acquiring some anonymous subscribers tells us very little about who they are, what they want and how we could serve them better. We could use URL tracking to understand what works and what doesn’t but I suspect trends would mirror patterns of what’s hot and what’s not that we see on other channels. These sorts of questions feel like the early email marketing days and that’s definitely matured into a really effective method of sending and receiving messages. From a user’s point of view they can sign up and unsubscribe to specific topics rather than receive everything – which using WhatsApp would be of danger of right now. I sound like I’ve not liked the idea of ONS and WhatsApp from day one, when in fact I was quite keen, but wanted to be led by our user’s appetite for it. If there is sufficient demand, we’d definitely trial it. I’m just not sure the appetite is there just yet. There could be a role for it now with a youth brand but probably as an extension of a campaign. If that’s you, here’s some thoughts on brands adopting messenger apps to their mix from a friend of mine. *Always makes me think of this old commercial.